The Great Train Extravaganza in Albany! 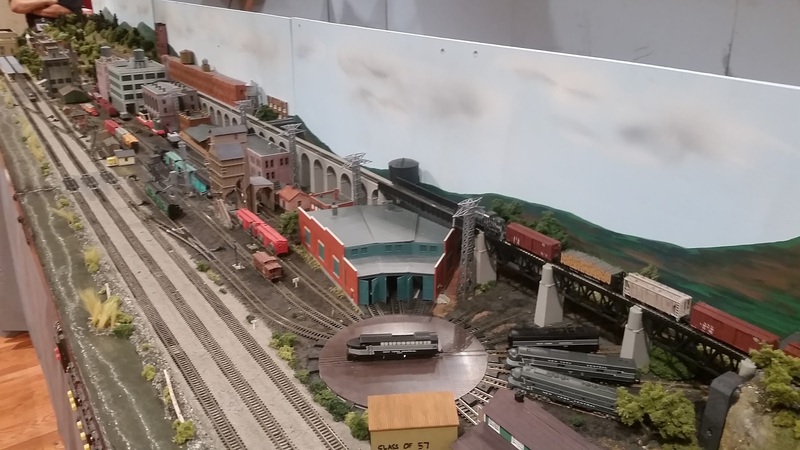 Since the last update, I started on a different section of the layout. Logically to cover a hole in the backdrop I had planned all along to add the covered bridge in the corner, but to make it look right was another thing. So I dove into the project, starting at the hole in the wall to where the road crossing will be by the feed mill. 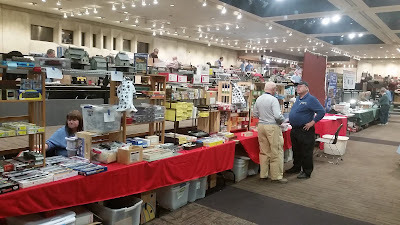 This section is about 12 feet. 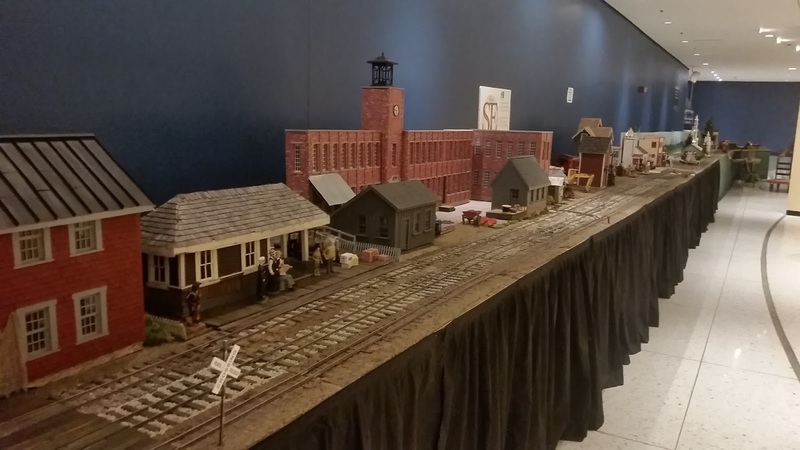 The station is a diorama I build in a Buffalo hotel room while working for the railroad out there. 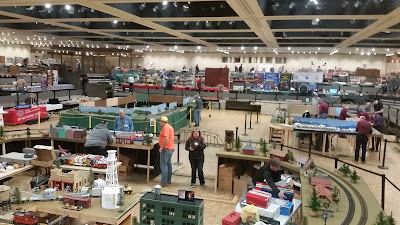 I fit into the space, it doesn't really go with the layout, but I like it, so it stays! 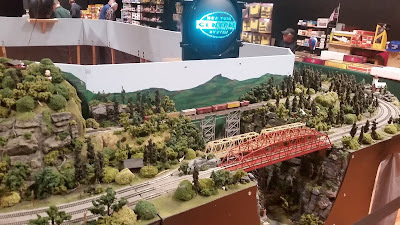 Starting some scenery around the bridge, I kitbashed this Walthers product. A full yard, before the Albany show, seeing what's staying and what I'm going to sell. 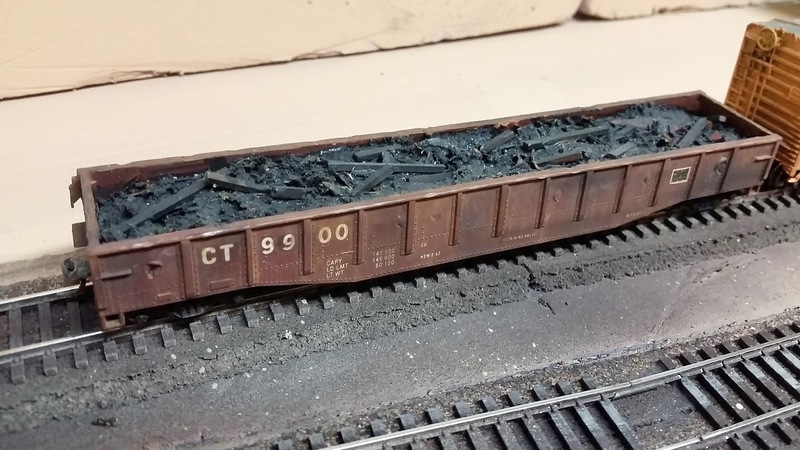 A 15 car coal train from the old layout, 100 ton cars from McKeen, needs work but will stay. 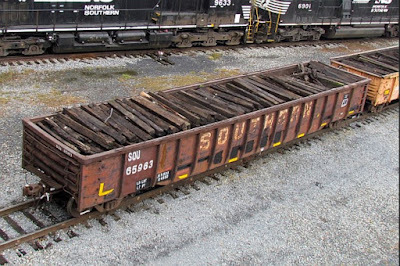 A converted Con Cor gon with a load of railroad scrap will stay too! 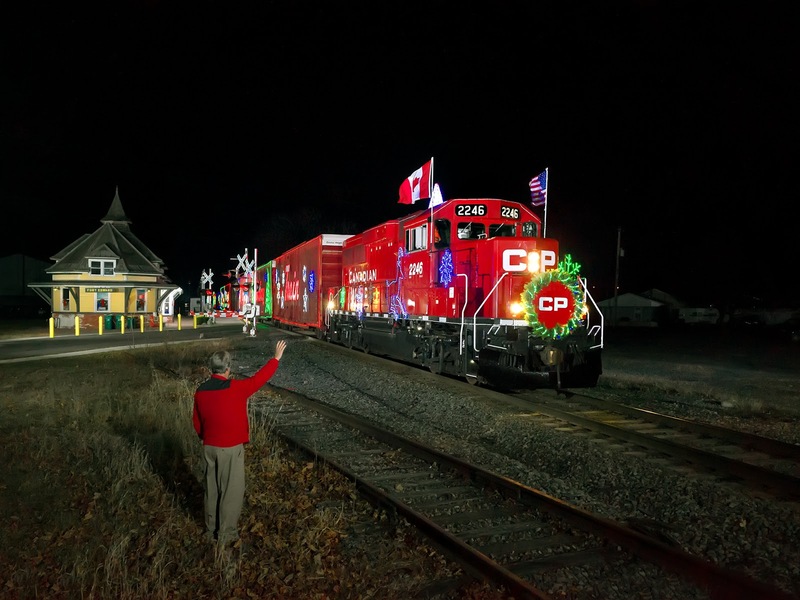 As with the arrival of Thanksgiving, the arrival of Canadian Pacific's Holiday Train ushers in the holiday season here in the Champlain Valley. 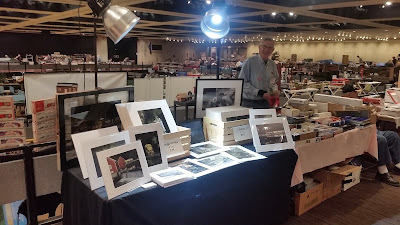 As the date drew near for the middle of the night deadhead move south from the U.S./Canada border to Albany, NY, Greg Klingler was inquiring of me where I wanted to shoot it this year as Greg was interested in posing in the photo for me! I initially replied (of course!) the overlook in Port Henry! Greg suggested the ex-D&H station in Fort Edward as I had not shot the Holiday Train there yet. Fort Edward won! The ex-Delaware & Hudson station at Fort Edward has been restored and from this angle its D&H heritage still shows. Arriving in Fort Edward between 00:45 and 01:00, I got right to setting up the lighting. Greg had agreed to meet up with me around 03:30ish. He shows up at 03:00. With the lighting done, all Greg needs to do is step into the scene and pose waving, while I do the rest, positioning him and checking the lighting on him. It has been “awhile” since Greg and I had met up and we shoot the breeze for a time, then walk over to the waiting scene and try some test shots. North of us, the 2017 Holiday Train behind GP20C-ECO 2247 is making its nocturnal deadhead move southbound to Albany, NY. This is Greg and my reason for meeting up! Through Plattsburgh, NY just after 01:00, I feel we have lots of time before we should expect to see the colorful train, maybe between four and five a.m. I’m thinking. The test shots look super here! Greg has his wave down again tonight! While we wait we converse on various topics then our attention is drawn across the tracks to a neighbor who emerged from his home. I notice “the dog” first. A hulking German Shephard accompanies the man, barking constantly! From what I gather, in between the barks, the man dose not like the lighting going off, as it falls in his yard etc. He wants us to stop. 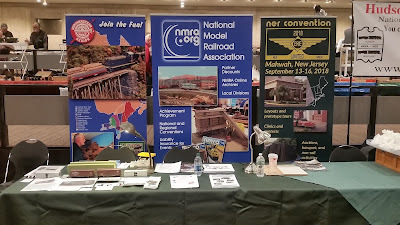 Greg and I quickly agree...............this man is probably NOT a railfan, LOL! There is no conversation possible though, the dog continues to bark loudly. I realize ahhhh...........situations such as this is what those hamburger patties laced with tranquilizer are made for! The neighbor returns to his home, then reemerges without the dog shining a flashlight at us saying............”You want a light? Here’s a light for yah!” We are silent, he starts cursing us again, then goes back inside. The photo unfolds in a few seconds! Down past the station and over the crossing comes 2247, passing my mark the lighting reflects back red! then the 2247 is by me, the fourteen trailing cars roll past then Greg is asking me how it came out? I get down from the stepladder and walk over to show him, Greg is ecstatic, as am I. Can’t wait to see it processed. What a beautiful train! Shot in Fort Edward, NY on November 26, 2017 at 04:24, 1/800 @f3.2. 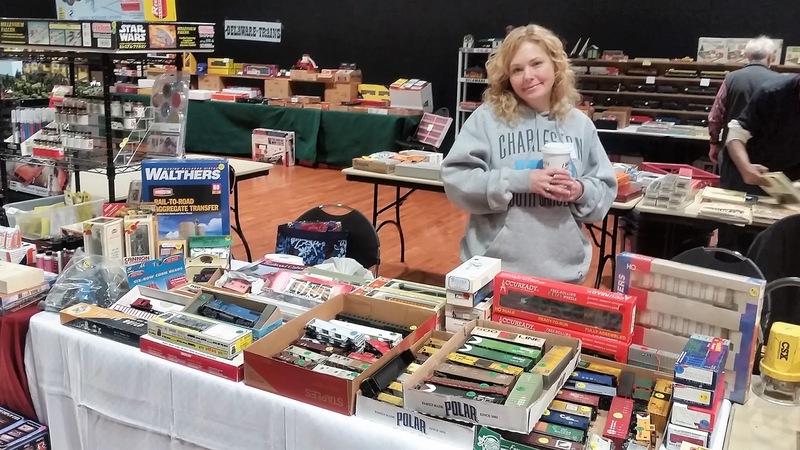 Special thanks to Greg Klingler! Please enjoy! Comments are welcomed. 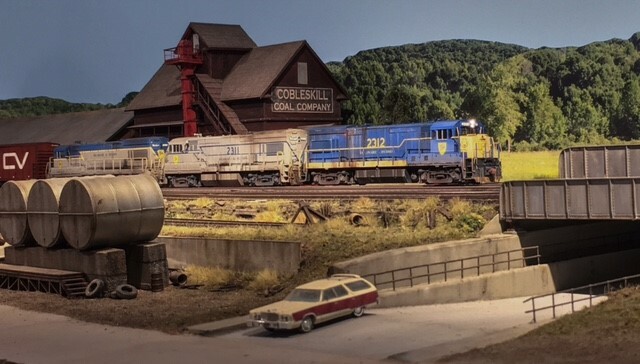 As I have mentioned before, we railfans who live near Canadian Pacific's (CP) ex-D&H Canadian Main are blessed to witness all EMD locomotive consists once in a while on the 252 & 253 trains in this age of General Electric dominance of the CP locomotive roster. 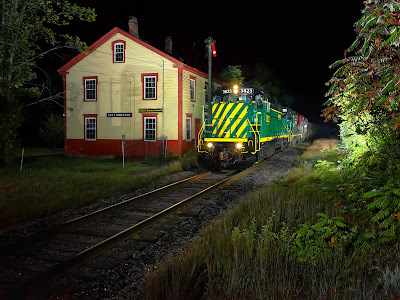 Another “treat” for D&H nocturnal train watchers, (at least this one) arrived early in the morning hours of October 29th in the appearance of Norfolk Southern's (NS) Pennsylvania Railroad Heritage engine, NS 8102! 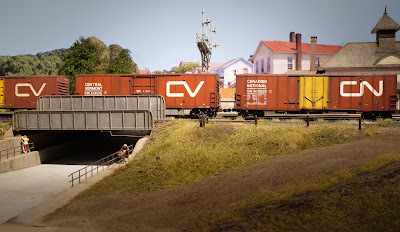 Leading CP train 931! 8102 wears one of the classier heritage paint schemes I think. 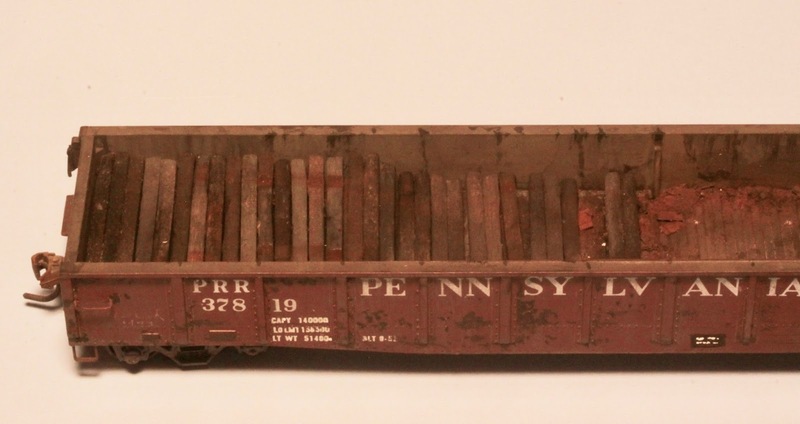 When the news arrived via the railfan network the night before, it was a “no brainer” where I wanted to shoot “The Pennsy” engine, from the roof of the ex-CP RS-18 in Port Henry. 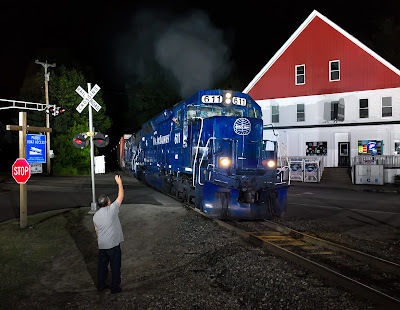 I headed out from home in Hinesburg at midnight, with 931 scheduled to depart Saratoga around the same time, confident I would give myself plenty of time to setup and do any tweaking of the lighting that was needed. All in all, involving at most forty five minutes. I figured two and a half hrs. 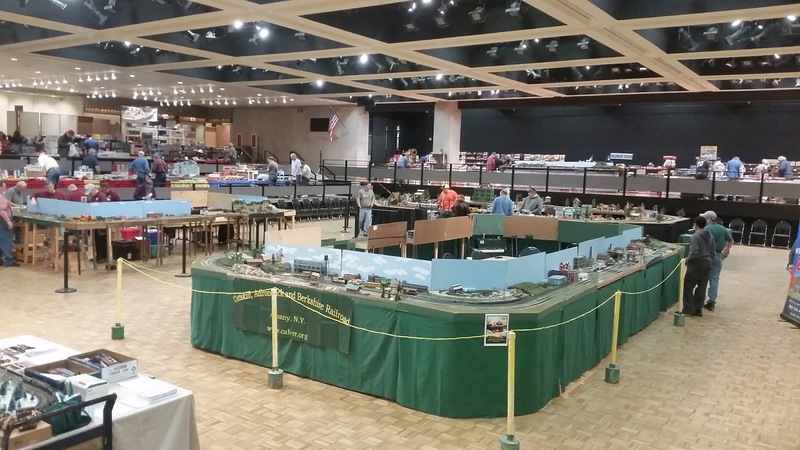 at best from Saratoga to Port Henry in 931s case tonight! Well.............how about two hrs. and eight min.?! 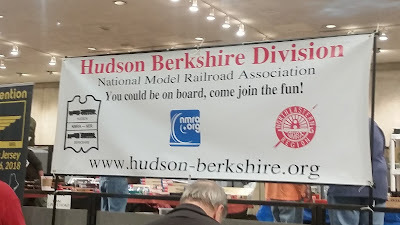 I was all set up and drinking tea................ on the ground, not up on the RS-18 cab roof of course, when I heard an air horn to the south of me, down Lake Champlain! My first thought hearing the air horn blowing for a crossing was........”I wonder what train this is? 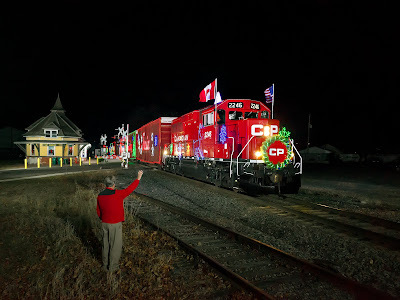 This cannot be my train?” Then the realization arrives that there is NO other train running northward tonight on The Canadian Main at this time! Oh man, the return of the Pennsy Heritage engine, which had visited the Canadian Main years ago, was about to happen! I was quite impressed with the quick run 931 was making tonight. I had learned the job departed Saratoga at 00:10, and here I was hearing them south of Port Henry before 02:00! It was not that long ago it took northbounds one and a half hrs. Whitehall to Port Henry. It turned out 931 had a short train, (twenty or so cars) which helped them make good time. Enjoying the moment, listening to 931s engineer blowing for crossings, the stars overhead with warm temps and tea to enjoy, it suddenly dawned on me it had been a while since 931 had blown for a crossing, and I knew they were in that stretch of track approaching town. Time to ditch the tea and get up on top of the RS-18 cab roof! It takes me less than a minute, I know the route by now, (big smile) and once up top I pause listening, hear nothing and take a test shot. Everything looks good! Now I hear the low rumble of GEs exhaust, followed by the occasional squealing of flanges as 931 negotiates the sharply curving trackage south of town along Lake Champlain. A louder low rumble, signaling the power passing over a small bridge less than a mile away. Out of the darkness, the bells in the crossing signals activate down around the curve below the station, the engineer blows for the crossing then headlights appear, yes! Here we go! 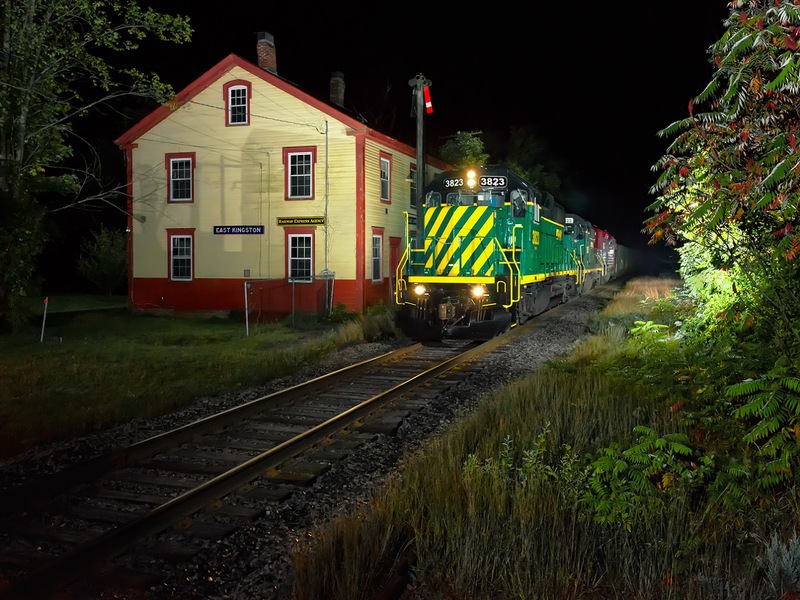 Coming up past the station, the station lights help transform the headlights into the Pennsy Heritage engine! Then the 8102 returns into the darkness, comes past my mark and the lighting reflects back Tuscan Red! Checking the image before I move while 931s consist passes by below me, it looks like success! And, 8102 is CLEAN! See what you think? Shot in Port Henry, NY October 29, 2017 at 02:18. 1/800 @f 3.2. Special thanks to Tyler Fortuin for his help! Please enjoy! Comments are welcomed. 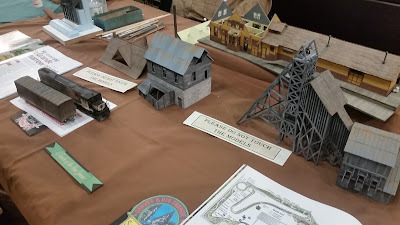 We were up to Bob Mohowski's last week Don Buesing and I, to do a little scenery on Bob’s layout. 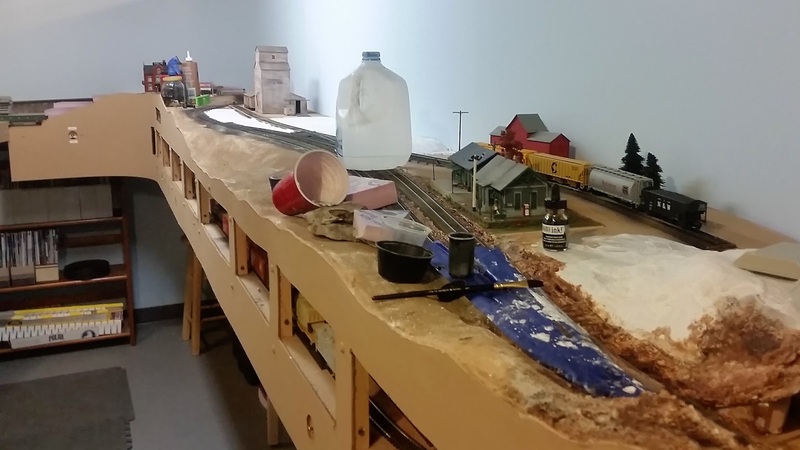 Bob started his layout about eight years ago and up until now, it has had no scenery at all! 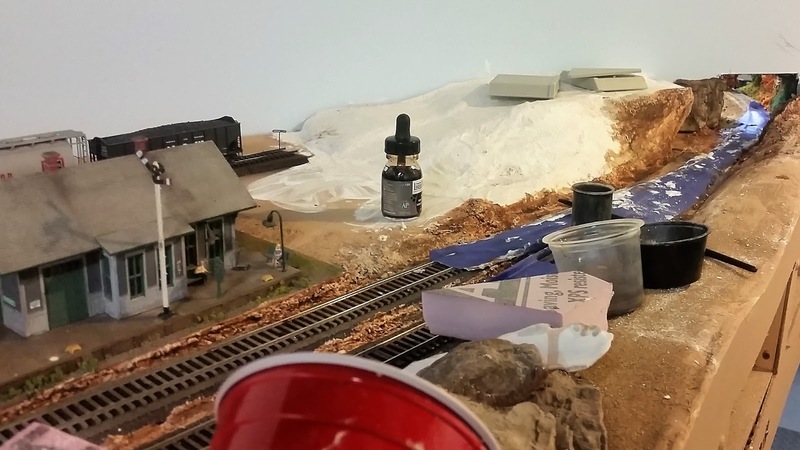 After a recent conversation with Bob, I offered to do a small section of scenery on the layout for him and he agreed to give me an area where I could make my contribution. I wanted to do something that would get Bob excited and energized about his railroad again, so Don Buesing and I agreed that we would meet up in Saratoga, and spend the day working on Bob's layout. 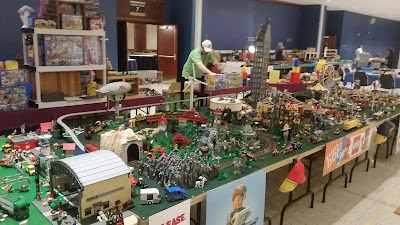 The day started about 9AM and ended around 9PM and though it’s just a start, it added a great deal of color to Bob’s Railroad. 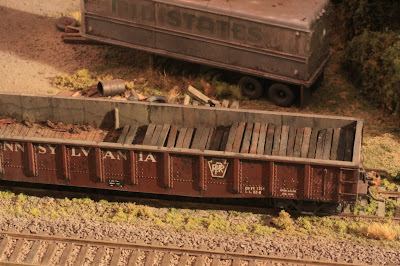 Bob works "Dryer Detail" to firm up the ground goop and get it ready for a darker earth colored paint. 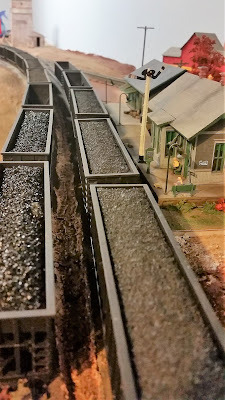 Don nailed the shot of Bob watching the first train rolling across the bridge. 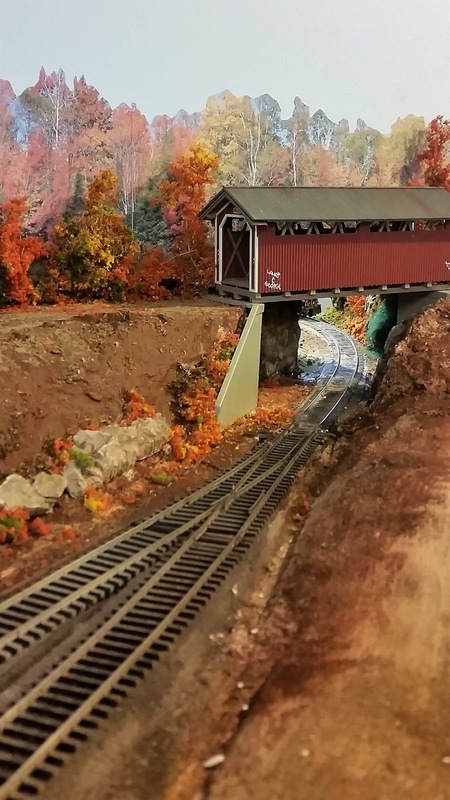 Don did a great deal of work below, removing the temporary roadbed for the skewed thru girder bridge ( built by Scott Lupia ) and prepared for a trial fitting of the piers which required a lots of modification. 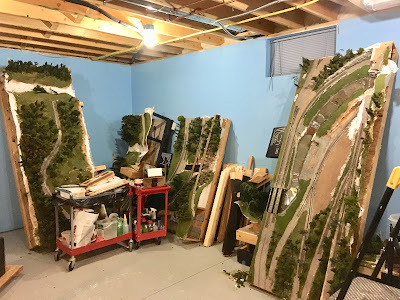 Once the fitting was complete, I weathered up the New England Brownstones bridge abutments that Russ had graciously sent out the morning after they were ordered, so that they would arrive at Bob’s on time for our work session on Wednesday. 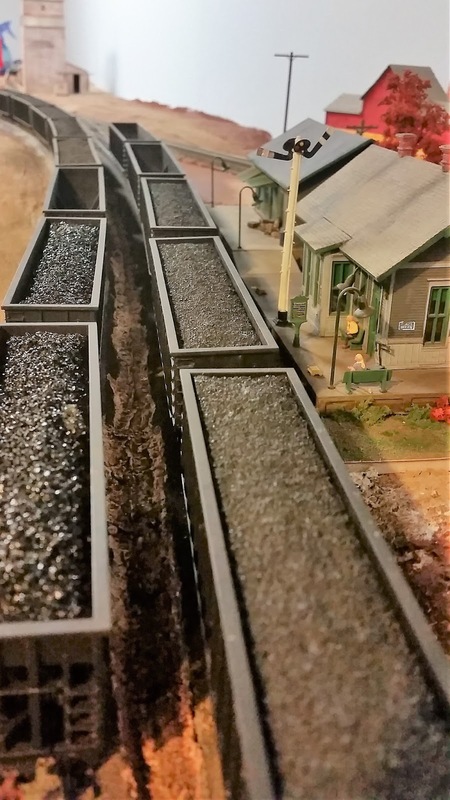 A coal drag moves upgrade through the cut, which was created using Rubber Rocks, ground foam and some photo backdrops which I shot this summer. West Waterford Update, We've Moved! For the past 2 months we have been packing up the layout. We are projected to move in December to our new house in Colonie, about 4 miles from my current house. The layout was disassembled into 16 modules. We will be reassembling the layout during the winter. Here is the link for My first YouTube video. Tonight finds me parked alongside the Pan Am Railways main line at East Kingston, NH, having driven down from Hinesburg under the pretense of catching the Pan Am Office Car Special (OCS) returning eastbound to Portland overnight after spending the weekend at the Glory Days railfan event in White River Jct. In theory, a great idea! In reality, while the OCS rarely runs at night, my back up plan was to shoot the New Hampshire Northcoast (NHN) gravel train, dependably returning around 04:00 from Boston. There also was a good chance the Pan Am freights EDPO and SEPO would be seen, powered by the newly acquired ex-CSX C40-8s. For a nice change, I was not dealing with a single train. The drive down from Hinesburg consumes close to three and a half hours. At this time of night though, it is a breeze, mostly interstate with little traffic. The drive went well until..........I was closing in on the last turn, from rte. 125 onto rte. 107. It’s eleven thirty and as I am looking for the sign for 107 I come upon on of those temporary led road signs warning of planned activities. This one read...........NIGHTTIME PAVING DETOUR AHEAD. Coming upon the paving, I was (predictably) detoured around the stretch of road that contained the turn for 107. I realized this after I had driven south a few miles. I then backtracked and asked some paving company folks how to get to 107 and East Kingston from here and they helped me out. A twenty to thirty min. delay. Arriving at East Kingston the eastbound signal is green already! 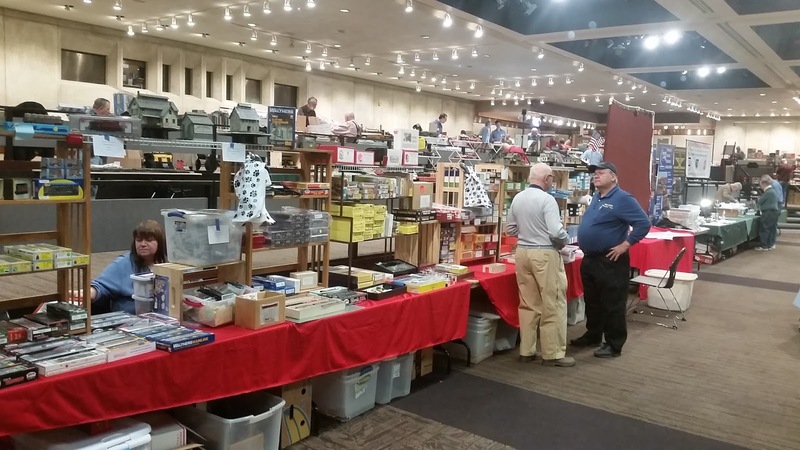 I was hoping this was not the OCS and was relieved to see EDPO come by. Now I could set up the lights and cut back the new growth sumac again, lol! I was last here in April, and was impressed at the reclaiming of ground the sumac had made! By midnight twenty three I was taking my first test shot. The next eastbound train would not show up until 04:39! By then it was obvious the OCS was not going to appear. 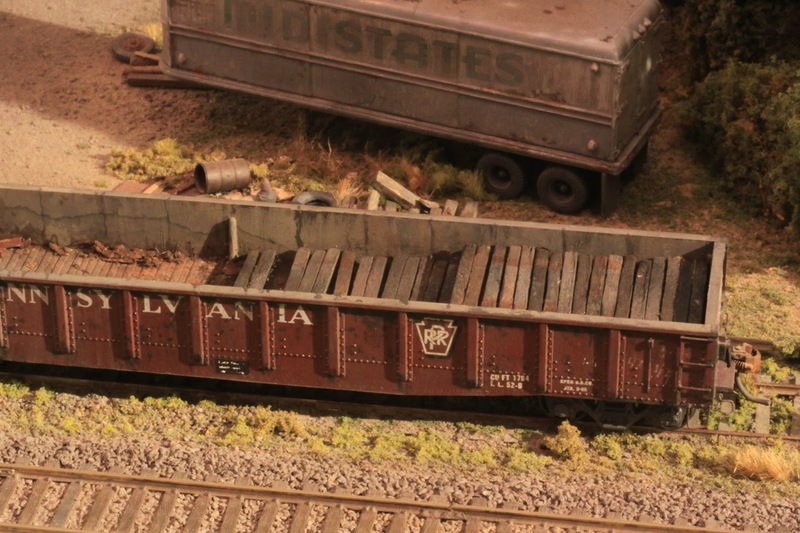 It was the timeframe for the NHN gravel train making its return trip from Boston. I kept busy tweaking the lights, then listening to Coast To Coast AM while staring at the eastbound signal. Trying to “will it” to turn green. That didn’t work well at all, lol! While in the car I spotted a good size skunk wandering the area, so when I was outside I kept “awake” with an eye open for it. It was well after 04:30 when the signal lit up green! This must be the gravel train I concluded. 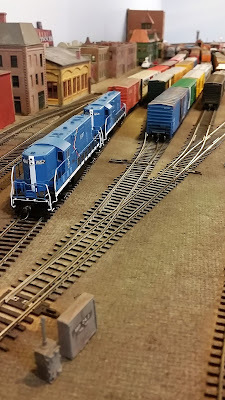 Running behind NHN GP 38-2s, this would be a nice catch indeed! I get up atop the stepladder, test the lighting, idling along all this time. and it looks fine. 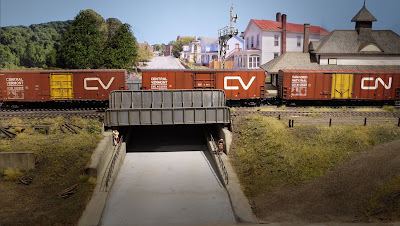 Within a couple minutes the crossing signals directly behind my position activate, the track down below the station lights up reflecting approaching headlights. I fire off an awareness flash for the crew. Now headlights appear, here comes the head end! I watch judging train speed as the lead unit quickly closes in on the station and my mark, I press the shutter release before the leaders pilot plow is by my mark. 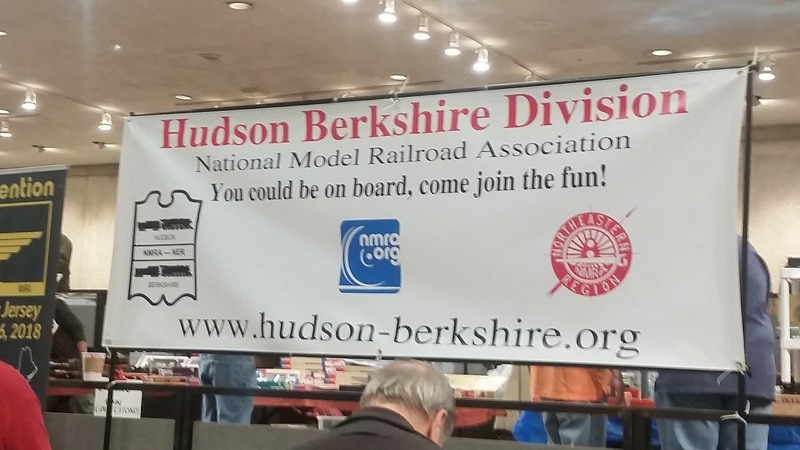 It turns out to be a good move as in the split second it takes for my eye to hand coordination to function, the front of the lead engine moves ten feet and is past my mark! But................the reflection! In the instant the lighting reflects back I see the striped yellow and green nose of the newly repainted and rebuilt GP 38-2 3823! 3823 is the only GP 38-2 with the stripes I believe? Then darkness envelopes the scene, in a rush of wailing air horn and locomotives the head end roars past me followed by the empty hoppers. Once the last car is by me, I get down and inspect the image. It looks good! I like the nose! The station is its usual photogenic self. The wait was worth it! 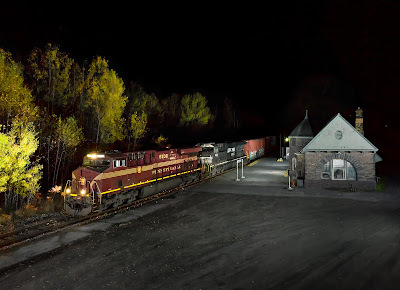 It is an honor to shoot trains at night here! See what you think? Shot on September 12, 2017 at 04:39, 1/800 at f3.5. Please enjoy! Comments are welcomed. year and it was time to get back on something besides scenery. choose film effects while shooting. I like the color range in the Pro via one better myself. 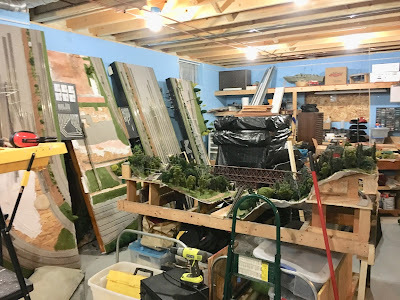 This past Sunday was exactly 10 days short of the one year anniversary of the layout's construction and also the second official Operating session here the A&S. I had busted my "u no what", to get a bunch of scenery and backdrops done so as to create a better feeling for the guys who had come to see the layout for the first time. My last night in Maine. Tomorrow, Sunday, I drive Mom and myself back home to Vermont in the bright hours............eeeek! I sacrificed the seafood dinner for a Subway Veggie-Delite salad with egg, in the interests of arriving in Livermore Falls, easily a two hour drive, before RUPO did. Once I arrived in Livermore Falls, I waited to hear some indication from the District One dispatcher of RUPO as the previous night I had heard them starting out of Rumford in the wee hours, most unusual. Instead, after an hour and a half, having heard nothing, I feared the worst, that the job was not in the area, and headed southeast to Winthrop, figuring I could double back in the event the job showed some sign of life and if not, I could still count of WAPO being around overnight. Thirty min. later I am in Winthrop, park and shut off the car to listen...........both to the scanner and for WAPO on the line that goes through town, after twenty min. of uncomfortable silence I get the idea to go to Monmouth. Maybe a twenty min. drive. Arriving in town from the north rather than the south, I drift down the hill to the rte. 132 crossing and turn to swing in and park at my familiar spot. Bright red reflects back from my headlights! Another car is parked in my spot! A man is inside staring back at me! What the heck!? You gotta be kidding me I thought. I drove down past the freight house, turned around and come back up and park behind the red car. Having heard nothing on the scanner, I figured to set up anyways hoping to see WAPO. 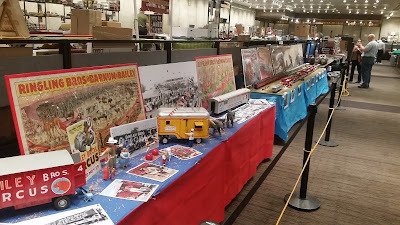 It’s my last night here for a while, I would like to shoot a train of course. I pop the hatchback, get out and change into hiking boots, then start to put together the lighting. The man jumps out to ask if he is “in the way”. I assure him he is not, and we converse about our various “missions” tonight. 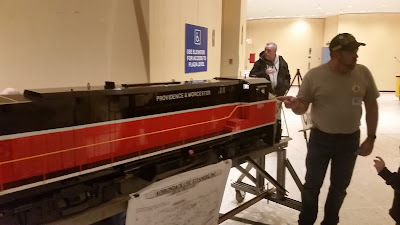 His name is Justin Berard, a railfan, he is waiting for WAPO as a friend of his, the engineer, is making his last run on this job before taking a yard switcher job in Waterville! Justin relates how he normally waits to see WAPO further east in Belgrade, but tonight, for some reason, he decided to go to Monmouth with his grandson accompanying him! We chat while I set up a couple lights. He asks about the lighting and what I am up to over here from Hinesburg, Vermont. Then Justin mentions how “they are already by Belgrade”. I walk a little quicker now, LOL! Knowing it will not be 02:30 tonight when they go by! Justin is surprised I seem to know where each flash unit needs to be placed, then I mention how I just did this setup last night! LOL! I invite Justin to pose in the photo waving to his friend for me. Please? He agrees to! His grandson is asleep in the car seat, so why not! I’m pumped up! This could be great! And to think I tried to bribe Bonnie & Richard Wingler to come over from Cadyville, NY and pose for me with the promise of a gift certificate to The York River Landing?! 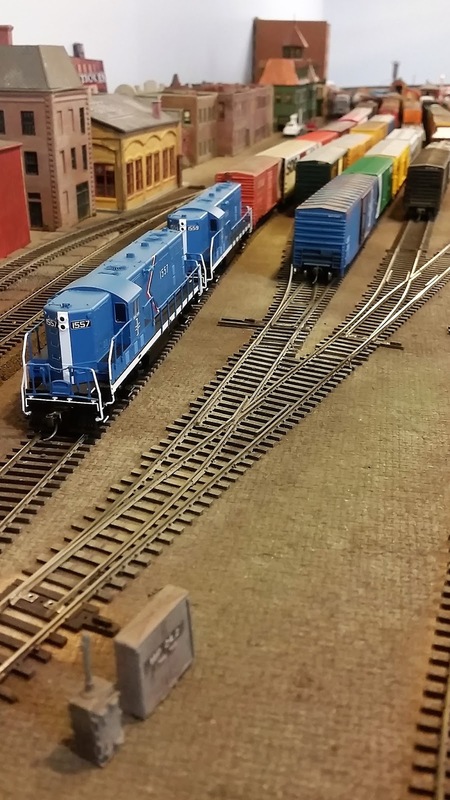 (Big smile) Justin shares the lead locomotive, it’s the 611, an SD45 carbody wearing the “Blue Dip” scheme. Perfect! I have not shot the Blue Dip here. Tonights the night! I finish setting up the lighting, (whew!) and I position Justin in the scene. After a couple test shots and repositioning of flash units, I’m happy. A headlamp goes on the ground behind Justins feet to remind him where he needs to stand and to prevent me from cutting off his feet while hand holding the tiny GR when the 611 comes past us. Just like it was rehearsed, an air horn blows for a crossing in town! WAPO is here! Like previous run-bys here, everything slows down. Minutes seem to pass as WAPO proceeds towards us. Justin practices his “wave” as I do a couple test shots. It is so quiet, the power sounds like it right up around the curve. Now the crossings signals activate, headlights illuminate the cut above the crossing then slowly swing into view, navigating the short tangent section of track then 611s loud air horn blows for the crossing leading WAPO over it! The live view monitor on the GR goes dark as the shutter closes down from the headlights! Justins is down in front of me waving away, I’m atop the stepladder watching my marks. This time I want to wait until the cab is closer to me. I’ve got Justins feet framed OK as 611s cab looms large coming off the crossing. I find my other mark as it goes out from 611s plow passing in front of it, pause, then press the shutter release. Blue reflects back before darkness returns! I give the engineer a wave as the cab slowly passes me then wait to carefully get down after the last car is past. There’s no waiting to see the photo though, it looks like SUCCESS on the back of the GR! I give Justin a thumbs up! Back down on the ground Justin agrees, he likes the photo too! We share emails before he takes off to follow his friend further southwest towards Portland. I am on cloud nine afterwards! This is a shot I wanted to get before the EMDs disappear with more GEs coming to Pan Am. I was reminded of the late Dr. Alan Irwin reflecting on tonights adventure. A constant source of encouragement and admiration for my railroad photography, Alan himself a highly skilled photographer, he was always reminding me how “Luck favors the prepared.” This was certainly the case tonight! Special thanks of course to Justin Berard! Shot in Monmouth, Maine on June 24, 2017 at 00:12. 1/800 at f2.8. Please enjoy! Comments are welcomed. "Old Ties - A Load For A Gondola"
Back in Chapter 12 I gave ideas and instructions on how to make both scrap metal and old wood loads for gondolas. 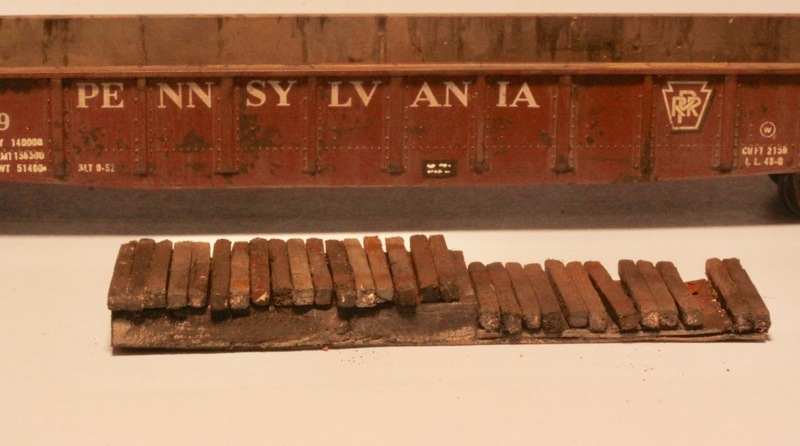 The scrap metal load went on to become an article for the "original" RMC (Aug 2013). 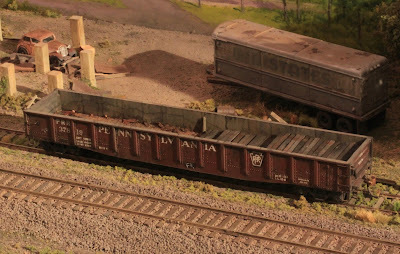 In Chapter 22 I gave you everything you needed to know about modeling a scrap tie pile. In this chapter I'll tie (pun unintended) the two ideas together in modeling a load for a gondola. I again used my wife's (used) Diamond matches. They come 300 to a box so you get plenty to go the distance should you choose to make a full load (photo 1). I made a partial load filling in the remainder of the floor with bric-a-brac and some Monster Model Works tie plates. The ties only consist of a single layer on top of a piece of 1/8 tick balsa and some grey cardboard for height (photo 2). I painted/stained the match stick ties individually with a combination of black, grey and brown. This is a bit tedious but, (I think) worth the effort for achieving realism. 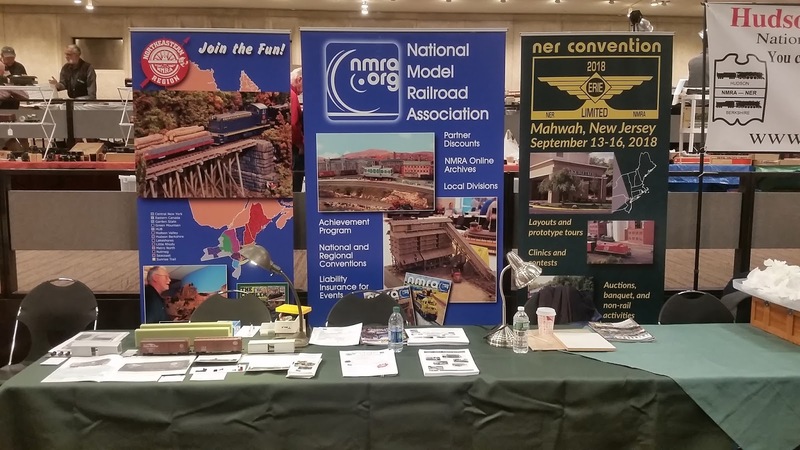 A caveat: I don't go to the rather insane level of explanation the contemporary modeling magazines go in describing my how-to methods. The "chapters" are meant to be inspirational. If you chose to follow up on any of my ideas you welcome to approach them in your own manner.